In 1995 former Weather Underground terrorists Bill Ayers and Bernardine Dohrn helped launch Barack Obama's political career at a small function in their Chicago home. Bill Ayers also hired Obama to head the Annanberg Challenge, a $50 million fund which enabled Obama to fund organisations which could enhance his political career. Later Ayers worked with Obama on the board of the Woods Fund, together doling out millions to leftist causes. Obama has consistently tried to minimise his relationship with Ayers and Dohrn. The couple themselves, seem intent on maintaining a low profile-until at least after the election. Both parties realise that Obama's opponents will seize on any links to Ayers and Dorhn in order to discredit the Senator. But are Ayers and Dohrn really out of the picture? Could they still be helping their friend from "underground"? I recently profiled Progressives for Obama (PFO). Founded earlier this year, PFO unites all the main leftist currents behind the Obama campaign-the Communist Party USA (CPUSA), the CPUSA offshoot Committees of Correspondence for Democracy and Socialism (CCDS), Democratic Socialists of America (DSA)and former members of the '60s radical organisation Students for a Democratic Society (SDS)and its terrorist splinter group Weather Underground Organisation. PFO aims to not only put Obama in the White House, but to build a huge united "progressive" movement that can force the new President to move America massively to the left. The influence of the CPUSA on the Roosevelt administration that produced the "New Deal" and the pressure of the CPUSA and SDS/New Left that pressured Johnson into the great social changes of the '60s are the model for this new movement. But this begs the question. Who founded Progressives for Obama? In early 2006, a group of former SDS members and sympathisers, led by DSA activist Paul Buhle joined with some a new generation of college students to re-found Students For a Democratic Society. The movement now has over 130 chapters across the USA. A review of the 2006 MDS board reveals some interesting connections. Noam Chomsky-Well known linguist, writer and activist. A member of both DSA and the CCDS Advisory Board. Carl Davidson-A founder member of SDS, later a Maoist ativist before becoming a leader of CCDS in 1992. Bert Garskof-Involved with SDS the 60s, a close friend of Bill Ayers and Bernadine Dohrn. David Graeber-Former member of the SDS, turned anarchist. Gerald Horne-A member of the editorial board of Political Affairs, theoretical journal of the CPUSA. Robin DG Kelley- A former member of the Communist Workers Party, more recently close to CPUSA. Michael Klonsky-Son of CPUSA member Robert Klonsky. A former member of SDS, who later led the pro-Chinese, Communist Party (Marxist-Leninist). Mike Klonsky works closely with Bill Ayers on educational projects. Ethelbert Miller-Chairman of the board of the notoriously leftist and Cuban linked Washington based think tank, Institute for Policy Studies. Charlene Mitchell-A leader of CCDS, former high ranking member of CPUSA. Michael Rossman (deceased)-A Californian New Leftist, with close ties to SDS. Mark Rudd-A former leader of the SDS and the Weather Underground. Howard Zinn-A well known Marxist historian. The connections between those listed above, Obama and Progressives for Obama are many fold. Carl Davidson worked closely with Obama in Chicago in the mid '90s and with another former SDS activist Marilyn Katz organised the famous 2002 peace rally in Chicago where Obama first came out publicly against the Iraq War. Davidson is the webmaster for the Progressives for Obama website. Bert Garskof is active in the Obama campaign in Connecticutt. He recently wrote this comment on the website Foreign Policy in Focus. We must realize that the only way to hold Obama, as President, to the progressive agenda is to maintian and build the grass-roots state/County organizations that were built only to elect him...We must remember that the most significant progressive changes have only been instituted into law after grass-roots activism forced the issue...we can maintain our more progressive values and work as organizers within the grass-roots election campaigns. We need to convince the new people and the many veterans of electoral wars that this is a unique opportnity. we can create 2-way communication with the People's President - truly make him the People's President if we create methods and structures that work to connect in an on-going way - the President, his staff and grass-roots Obama groups for discussion of what the grass-roots thinks and wants. Gerald Horne, an historian who has studied the Hawaiian Communist Party-was first to publicly reveal the connection between Barack Obama and his boyhood mentor, secret CPUSA member Frank Marshall Davis. Mike Klonsky was a blogger on Obama's website until negative publicity forced his withdrawl. Klonsky's brother Fred and wife Susan are both listed as endorsers of the Progressives for Obama website. Bill Fletcher was the initiator of the Progressives For Obama project which he co-founded with Tom Hayden. The other two founders of PFO were writer Barbara Ehrenreich, who is a member of both DSA and MDS and actor/activist Danny Glover who is close to some DSA members. Mike James, Robin DG Kelley and Mark Rudd are all listed as endorsers of the Progressives for Obama website. A quick trawl of the internet reveals several other MDS linked activists listed as endorsing Progressives for Obama. They include MDS founders Paul Buhle and Thomas Good (a former communist turned anarchist who has referred to himself as an "unrepentant Weather supporter. "), Texan former SDS activists David Hamilton and Thorne Dreyer, Chicago based Obama fundraiser Marilyn Katz, Marxist academics Rosalynn Baxandall and Immanuel Wallerstein, plus Cornel West, an academic and DSA member who refers to Obama as his "comrade." Another interesting turn-up is Rashid Khalidi, nominated unsuccessfully for the MDS board. Khalidi was a close friend of Obama's from his time in Chicago in the 90s. Khalidi has been accused of ties with the Palestinian Liberation Organisation and has written for the pro-Obama, Chicago based DSA/IPS linked journal "In These Times". Three of the four founders of Progressives For Obama, Bill Fletcher, Tom Hayden and Barbara Ehrenreich have served on the MDS board, as has the PFO webmaster Carl Davidson. Several MDS activists are endorsers of PFO. Obviously, Progressives for Obama is an MDS creation. While Bernardine Dohrn's high level role as an MDS board member is clear, Bill Ayers's is less so. 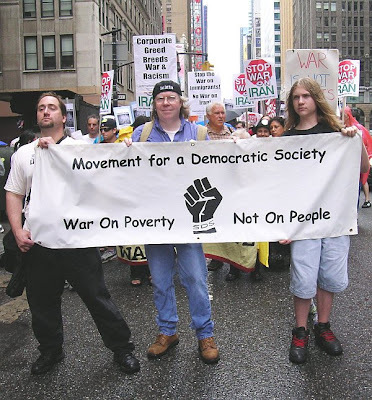 Movement for a Democratic Society (MDS) held its first national convergence at Loyola University, from November 8 through 11 (2007)with the participation of the newly inspired SDS, Students for a Democratic Society. Below are four Youtube videos of Bernardine Dohrn and Bill Ayers speaking at an November 2007 SDS reunion at Michigan State University. Note Dorhn's reference to the new SDS and MDS. Note references to the overthrow of capitalism, visits to Chavez's Venezuela and building a "new movement". These people are still revolutionaries. 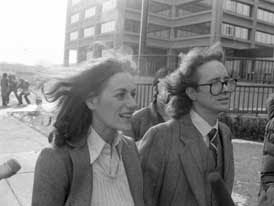 Bill Ayers and Bernardine Dohrn are involved in an organisation uniting three Marxist parties, a host of '60s radicals and terrorists and a new generation of militant activists. That organisation has spawned a spin-off organisation specifically designed to put Barack Obama in the White House and to bring about massive social change across the US. 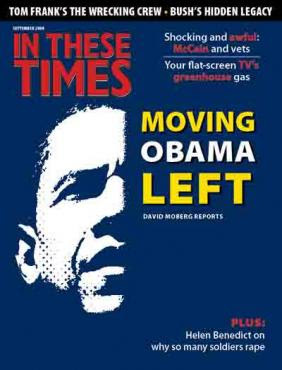 Ayers and Dohrn helped launch Barack Obama's political career. Do they guide it still? Do you have any information linking these folks to the International ANSWER group of communist protesters, or are they another offshoot / parallel org? I covered several of the Intl ANSWER events in L.A. over the last few years, including their use of fraudulant addresses (abandoned / vacant buildings) to file their march permits. So many different factions and splinter groups I wish they'd just skip right ahead to the inevitable circular firing squad / night of the long knives / icepick festival, and save us all a lot of trouble. Yes, excellent. Thanks so much for sharing. Were you the one who visited Count Us Out and left the link to this page? If so, thank you. Anon 2 ANSWER is a front for the Party of Socialism and liberation-a splinter of the old Workers World Party. far-far leftists. DSA, CPUSA and DSA are more pragmatic and work for "socialism" with and through the Democratic Party-these are obama's main leftist backers. Count us out-wasn't me, but I have seen your blog before. thanks for the link. Echoing Dr. MLK's comment about the "most violence" being in her own country, and adding that it's true "even now" shows a very narrow, pathetic and naive view of the world. I expect better from so-called academics. Perhaps that other hippie should have whispered "Darfur" in her ear before she sounded like a total idiot. Thank you for posting a very tidy package about Obama's power supply. I think the plug will be pulled in November. Please check out this collection of videos... I think you'll find them most interesting, especially "BAD COMPANY - Radical Friends and Terrorist Associates of Barack Obama." Senator McCain suffers from a convenient historic amnesia as he carps about Bill Ayers. Nothing that supposed urban terrorist Bill Ayers said or did could compare to the mass destruction, the death and tragedy brought to the Vietnamese by McCain and the armed forces he blindly served. Better patriots than he saw the war on Vietnam for what it was – mass murder from the air and on the ground. Murder most foully unjustified. Justified not by international law, nor the US Constitution, nor the Charter of the United Nations. Nor were our chances of winning the war supported by the long history of the conflict, or by the wishes of the masses of Vietnamese people. In fact, President Eisenhower said that if we allowed an election (something we never did) in Vietnam, 90% of the people would elect Ho Chi Min, the man at the head of the forces opposing us. Nor was the war supported by the American people as a whole. Most of us were horrified at the deadly force and murderous weapons of mass destruction brought down on the Vietnamese. From high altitude bombing to napalm to rapid firing multiple barrel machine guns, our air and ground forces killed an estimated 2 million people. We actually rained down more bombs on the small country of Vietnam than were dropped by all participants in World War II on the whole planet. Nor was it, by the end, supported by many of the young men and women serving in that un-winnable and morally untenable war. Many service men refused to fight the Vietnamese. Many young men fought the draft, fought the intrusion of ROTC on campuses. Pilots refused to take part in this immoral action. One was a friend of mine, Captain Dale Noyd, who was Court Martialed. Were Dale, now deceased several years, to come back and run for president and were he to point to his war record, I would say here is a man who could serve the country as he did during the Vietnam War. Whereas, Senator McCain represents today, all that was sordid and cowardly in those years. He reaps no glory for, nor brings any moral rectitude to his campaign because of his years flying high tech missions over Vietnam. His actions then against the Vietnamese, as his rah-rah support of the war in Iraq and Afghanistan now condemn him, most profoundly condemn him. "Obama motivates D.C. to initiate new lower and middle class bailout"
Mmoinn.com launched a new cheap wow gold , players can more quickly be wow power leveling , as soon as possible to buy wow gold it! I never know the world's strongest country's president is only linked to Terrorists. Great to know that.